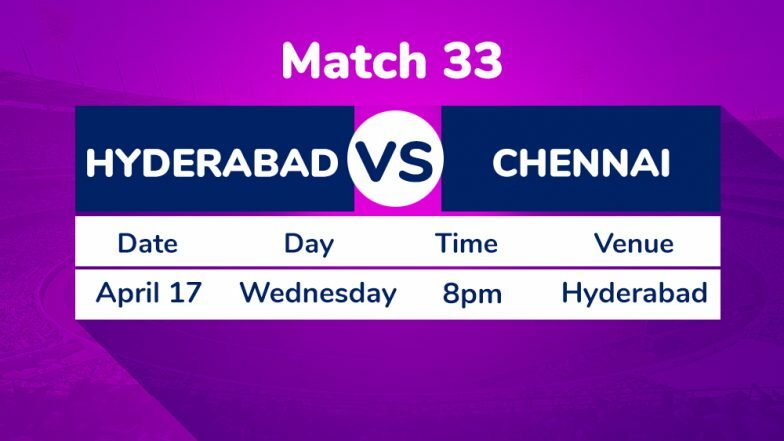 Hyderabad, April 16: It will be an uphill task for the Sunrisers Hyderabad to secure a victory and get back on the winning track when they take on Chennai Super Kings at the Rajiv Gandhi International Stadium on Wednesday in the ongoing edition of the Indian Premier League. Sunrisers, who secured three back to back wins after their loss in the opening encounter in the ongoing IPL, have failed miserably in the last three games. Their batting, which has been largely dependent on the destructive opening pair of Johnny Bairstow and David Warner, hasn't been able to perform and appears to be in disarray as none of the other batsmen have taken the responsibility and finish the games. Ambati Rayudu in Focus After Facing ICC World Cup 2019 Snub As Unstoppable Chennai Super Kings Take on Sunrisers Hyderabad. The Kane Williamson-led side are currently standing at the sixth spot in the points table, and would be desperately hoping to get a win under their bag and move up the table. Chennai, on the other hand, is sitting pretty at the top of the points table with 14 points from eight games. The Men in Yellow will look to confirm their spot in the playoffs against the Sunrisers. In the batting department, Suresh Raina, Faf du Plessis and captain M.S. Dhoni have all been among the runs while the bowling has also looked pretty strong with Deepak Chahar, Imran Tahir and Harbhajan Singh taking the responsibility and picking up wickets at regular intervals. Kings XI Punjab vs Rajasthan Royals Live Cricket Score 32th T20 Match.